It means more than half the followers of Prime Minister Narendra Modi and Congress president Rahul Gandhi on Twitter are fake, according to a study conducted by digital platform Twiplomacy. Rahul Gandhi with the highest percentage of fake Twitter followers: 69 percent. He is closely followed by BJP president Amit Shah (67% of his Twitter followers are fake). 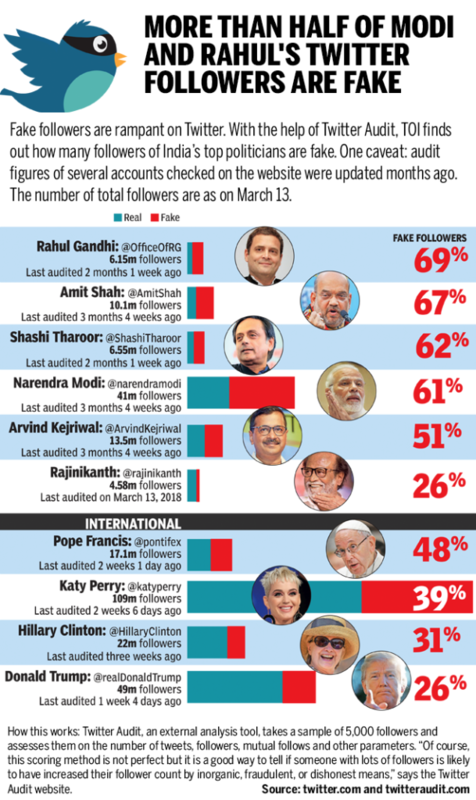 PM Modi, the most followed Indian leader on Twitter, stands at number three (61 percent of his Twitter followers are fake). On the other hand, US President Donald Trump’s percentage of fake followers is much lower than our Indian leaders – at 26 percent. The audits of several Indian accounts checked on the website were updated months ago. The time they were last audited is indicated in the graphic. The total number of current followers are as seen on Twitter.com on March 13. The list also features Arun Jaitley, Arvind Kejriwal, Sushma Swaraj and Rajnath Singh.